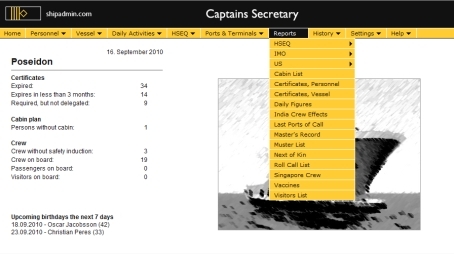 Designed by Captain's and experienced seamen, "Captains Secretary" is designed to reduce the time involved with ship administration by more than 50%, it's straight forward and clear navigation can be learned in less than 4 hours and records are always available using the Search function. Reports are available for Meals, Accommodation, Sub-Contractors on Board, and others that can be customised for you or you can generate specific reports for yourself. Lets us provide you more details, contact us at Sales: email: jr@sjovold.net, Mobile: +65 9002 9182. 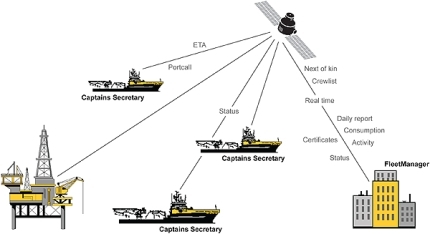 Using the on board communications system the "Captains Secretary" can be connected to the management systems at HQ and as the voyage progresses Management at HQ can track the commercial performance and other aspects of the Ship Operation to provide timely assistance and analysis on operation and efficiency. If this online tracking would help you manage your vessel's, contact us now for more details; Email: jr@sjovold.net, Mobile: +65 9002 9182.